Powdered Antifoam will not clog or freeze. Metal Housing withstands stamping applications. Compact Q8SE metal housing for Q-pak sensor works in stamping industry, die sensing, small assembly equipment and semi-conductor applications. Zinc housing measures 0.315 x 0.787 x 1.260 in., has dual mounting, visible LED at cable entry, and provides 0.118 in. sensing range on mild steel. 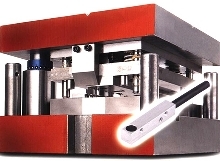 Adhesive Dispenser is suitable for UV bonding processes. Air Sampler checks airborne contamination. Venerable MB2 can be used to sample airborne contamination in indoor and outdoor environments. Microorganisms are collected on agar surface of contact plate, which is removed and sent to analytical laboratory. Colony count, combined with volume of air sample, is used to calculate number of microorganisms present per cubic meter of air. Film Laminating System puts thermoplastics onto steel. Measurement System is ideal for water treatment facilities. Accu4 online turbidity measurement system employs USEPA approved Method 2, 4-beam ratiometeric measurement technique to provide accurate low level turbidity measurement. Technique automatically calculates out interferences such as process color and sample chamber fouling. Set of diagnostics is loaded into T53 analyzer allowing assessment of system operational conditions. Speed Sensor measures turning speeds from a distance. SpeedVue Model 430 uses Class III laser in conjunction with signal processing to measures shaft rpms on highly polished shafts from up to 100 ft away. Signal-processing algorithm required is built into Model 2120A portable RBMconsultant data collector/analyzer. Sensor can be used to measure turning speeds of pulleys, as well as linear speeds of felts on paper machines. 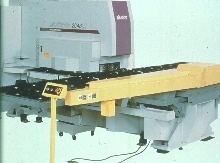 Punch Press features 46-station capacity. Brushes feature high filament density. 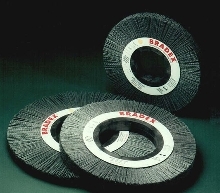 BradexÃ‚® Composite hub fiber abrasive radial wheel brushes have embedded fibers across entire surface of their indestructable cores. This reduces filament breakage and allows filaments to perform consistently throughout wear process. Wheels are well balanced to aid in reducing machine fatigue. 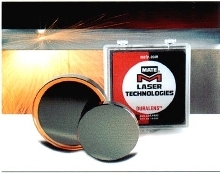 Laser Lenses fit most laser cutting systems.